Definition: Extension spring operated devices or mechanisms where the extension spring is required to be pulled and extended by a load to later return to its original length once the load has been removed. Extension springs are used in many applications which assist our every-day life. They are easy to miss and extremely under estimated as to the functions they perform and how they are able to make our lives easier. The coils in an extension spring are close wound and are kept together by an initial force called initial tension. To know how much initial tension a spring has, you must extend it to a point where you can see light in between the coils. That is when the initial tension is released. Both the force and the initial tension of a spring are based on a the spring’s physical dimensions as well as their material type and manufacturing. 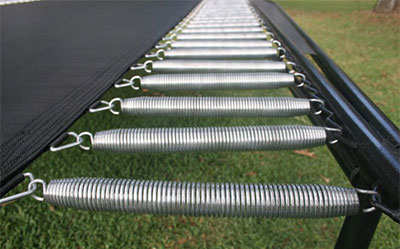 The several applications in which you’re able to find extension springs include trampolines, screen doors, exercise equipment, toys, weapons (firearm springs), amongst many other mechanisms. The extension springs applied in trampolines are all working in parallel so when your weight is applied on the mat, they are extended, but once you jump down on the mat with more force, the energy stored in their coils automatically want to compress back to their original pre-loaded length so they pull on the mat and that’s what cause you to be “thrown” or “ejected” into the air. 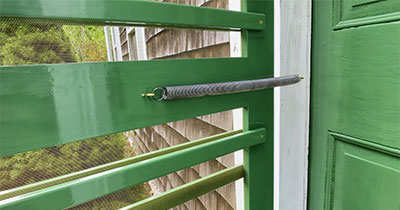 In the case of a screen door, the spring is pulled from its pre-loaded/unloaded position when you open the door so once you let go of the door, the energy in this extension spring’s coils causes them to automatically pull the door shut again. This is how extension springs work in the applications they’re installed into. At Acxess Spring we have provided you with several tools that’ll help you either start a new spring design, improve a design, shop for stock springs, or generate a custom instant quote! Need replacement extension springs or simply need to test some springs out? Search for stock extension springs using Spring Finder. If you’ve already passed the prototype stages of your project and are looking to order larger production quantities, get live pricing for your custom extension spring using Instant Spring Quote. To design your spring or to improve a design we provide technical articles filled with formulas and diagrams that’ll help you better understand your design. The best design assistance we’ve provided is Spring Creator, our online extension spring application calculator. Here you are able to calculate anything from rate to your spring’s load and travel capabilities and the best part is that Spring Creator includes both the Spring Finder and the Instant Spring Quote so you can design and shop at the same time! Spring Creator is now mobile as well. Download our extension spring calculator application on your tablets and smart phones. It is available on both Android and iOS systems. Our Spring Creator application will complete all the tasks our PC version is able to achieve. Click on the links below to download.